Leica Store Wetzlar Leitz-Park opened its doors on May 22, 2014 and is located right in the middle of Leica Camera’s headquarters, the newly completed Leitz-Park. The store features a 400 square meter display area for the entire Leica product portfolio, a fully equipped photo studio and an ambiance inviting visitors to stay a while and chat with like-minded Leica enthusiasts. The store is open Monday through Friday from 9:00 – 17:00. Below, Alfred Schopf, CEO of the Management Board of Leica Camera AG shares his thoughts on the new store. Q: What is it like for Leitz-Park to have the newest Leica store? A: If you take a look at the building from the outside, it makes a statement. We wanted to incorporate what you see on the outside to the inside. We had the idea to create something unique, a place where you can look at the heritage of Leica and photography. It all has to fit together within the architecture. At least in Europe, and perhaps all over the world, you aren’t going to find many iconic brand stores like that besides some watch stores. It’s not about a single element either. Of course, we are proud of the store, but it’s always the combination. We want to incorporate that in all of our stores because in the end, our cameras are an instrument. You need to learn how to use it and we want to be able demonstrate that great images can be shot with such a device. Q: The first official Leica Library is at the Leica Store Los Angeles and is curated by Martin Parr. 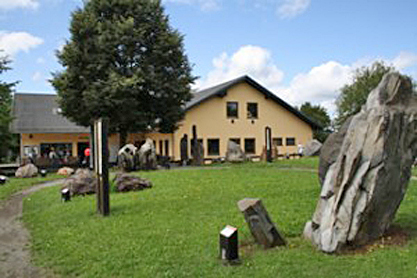 The Leitz-Park store has a library well. Will libraries be a feature in future Leica stores? A: As long as there is enough space, all of the stores will have them. All superstores will, at least. Q: Is the Leica Store Wetlzar Leitz-Park’s library curated by Martin Parr? A: Not yet, but it will be in the future. Q: You have quite an impressive library personally, don’t you? A: The books inspire me. I like to have them around me. If my office moves, they come with me. They are like my old friends. Q: The other day, a Porsche motorcycle was rolled into the store. Can you tell us about that? A: That was so people can see what kinds of stuff they can photograph. The store features a full photo studio. Q: Is there going to be any specific artwork at the Leica Store Wetlzar Leitz-Park like the “Fake Leica” from the Leica Store Los Angeles? A: The “Fake Leica” is a hiccup. The artist who did it did a great job. The front is an analog Leica and the back is a digital Leica. I’ve seen a lot of techies approach it and complain that he butchered it but they don’t realize that it was purposeful, just to get you talking about it. Sometimes you have to ruffle some feathers. Q: The Leica Store Wetlzar Leitz-Park has some special edition products that can only be found here. Can you comment on any of the items? Are there any that are particularly special to you? A: We created the Leitz-Park brand and wanted to have something specific to it. That’s the idea behind it. We want to attract people to visit us in the future. We think that naming where you bought it, at the company superstore, is just a good approach. It’s a destination. It’s the birthplace of photography and we want to integrate more and more of that idea into our marketing approach. For me, it’s not that we talk about Leica history but that we talk about the history of photography. Oskar Barnack was really a genius. I mean, if you take a look into the X1, it’s 95 years after Oskar Barnack’s invention and the size is just the same. You don’t need something different. You have it in your hand and it’s a good balance. It’s quite amazing to see that. Leica is always trying to incorporate that into our work. The special editions include four cameras, a Leica S, a silver chrome Leica M Monochrom, a Leica X Vario and a Leica X2 à la carte, and two pairs of binoculars, the Leica Ultravid 8×42 BL and 10×42 BL models with special red leather trim. Q: Can you tease us about what might happen at photokina? A: I don’t want to give away too much to our competitors. Our research and development team is working on some new stuff. You can expect something, but I don’t think I can remark now. All of my colleagues will get nervous. Q: It seems like people flew in from all over the world for the Leitz-Park opening. Do you agree? A: We are getting visitors from all over the place. The other day, the Deputy Prime Minister of Bahrain was shopping in the store. There are Leica enthusiasts everywhere! Thank you for your time, Mr. Schopf! Leitz-Park Opening Festival from Leica Camera on Vimeo. The grand opening of Leitz Park in Wetzlar has come and gone. After the speeches and the introduction of new products from Leica, the daily work of making cameras and lenses have returned and memories linger. Here are several photographs that offer a look behind the scene of the celebration. The celebration was also used to award this year's Oskar Barnack Prize. special exhibition of photographs by Leica photographer Reimund Schwarz. Besides celebrating the official opening of the new headquarters of Leica Camera AG., Leica surprised everyone with the introduction of several new items. First on the list is a new, non-electronic film (yes, film!) camera, the Leica M-A. It emphasizes the continued commitment of Leica to no digital cameras and keeps them solidly as the only major camera manufacturer to do so. 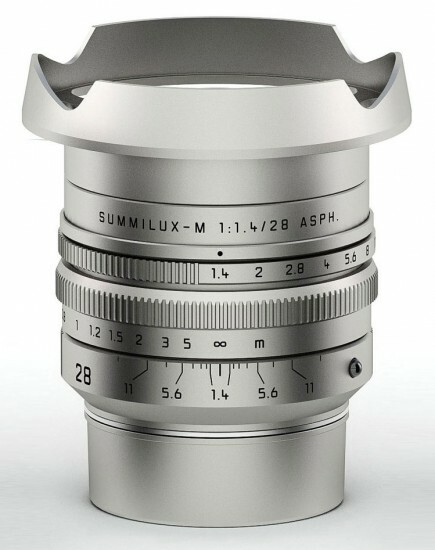 Next is the new LEICA SUMMILUX-M 28 mm f/1.4 ASPH,. One of the fastest 28mm lenses on the market. Little else is known at this time, but we will report on this new lens as soon as additional information is available. With the Leica Macro-Elmar-M 90 mm f/4, Leica Camera AG presents a new, collapsible macro lens for the Leica M-System. As in the case of the previous generation of this lens, its performance has been optimised to cover the entire working range, from infinity to the closest macro focusing distance. This makes the Leica Macro-Elmar-M 90 mm f/4 ideal not only as a moderate, universal telephoto lens, but also as a macro lens with exceptional imaging performance at close focusing distances. For example, in combination with the new Leica Macro- Adapter-M, specially designed and constructed for use with the Live View function of the Leica M, it allows photographers to capture spectacular close-up exposures at a reproduction ratio of up to 1:2. 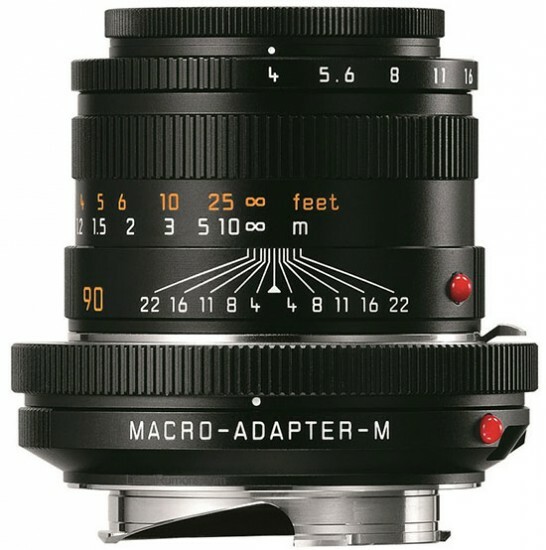 The Leica Macro-Adapter-M is designed to be mounted between the camera and the Leica Macro-Elmar-M 90 mm f/4. Its integrated helical screw system allows a variable extension of the lens of between 18 and 30 mm and thus enables the variation of the reproduction ratio. When mounted on the adapter, the Leica Macro-Elmar-M 90 mm f/4 can also be used in its collapsed position for exposures up to infinity. Thanks to a new locking function, this allows photographers to set any distance from 41 cm (reproduction ratio 1:2) to infinity without having to dismount the adapter. Without the adapter, the Leica Macro-Elmar-M 90 mm f/4 is an extremely versatile telephoto lens – for example, for portraits with shallow depth of field and in travel photography for capturing details in landscapes. For reportage photography, the Leica Macro-Elmar-M 90 mm f/4 allows photographers to capture discreet shots at a greater distance from their subjects. In comparison, the Leica Macro-Elmar-M 90 mm f/4 is a compact and lightweight alternative to existing Leica M-Lenses of this focal length. When not in use, the lens can be collapsed to save valuable space in the camera bag. The optical design of the new Leica-Macro Elmar-M 90 mm f/4 comprises four lens elements in four groups. Its imaging performance is very good across the entire image field. Even wide open, at f/4, the lens delivers near optimum performance. This high imaging performance is preserved almost completely in its closest focusing range. The only significant effect of stopping the lens down is an increase in the depth of focus. 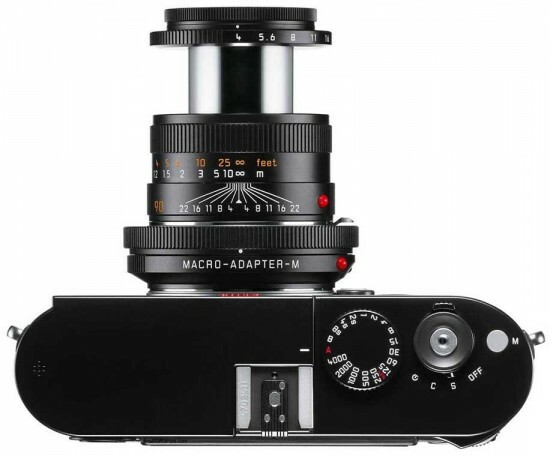 The Leica Macro-Elmar-M 90 mm f/4 and the Leica Macro-Adapter-M will be available from June 2014. In addition, there are the Leica M Edition 100: Leica M-A and Leica Monochrom in Stainless Steel. The pure non-electronic Leica M-A is based on the LEICA MP. All of the visible metal parts both of the Leica M-A and the Leica Monochrom are made of solid stainless steel. In addition, there is a set of three Summilux lenses with 28, 35 and 50mm focal length. The Leica M Edition 100 is limited to 101 pieces worldwide. This year, Leica Camera AG is celebrating 100 years of Leica photography. On the occasion of this special anniversary, the company has already announced two special centennial editions – the Leica S Edition 100 and the Leica D-Lux 6 Edition 100. And now, a uniquely special highlight will be presented in the course of the official opening celebration for the new Leica headquarters in the Leitz Park complex in Wetzlar on 23 May 2014: the Leica M Edition 100. As the first Leica special edition of its kind, the Leica M Edition 100 brings together a purely mechanical rangefinder camera for film photography – the Leica M-A – with a digital M (Leica M Monochrom) in one set. The combination of these two cameras is unique. Its symbolic character as an homage to the beginnings of Leica 35 mm photography and, in particular, to black-and-white photography makes the centennial edition truly special. This applies, above all, to its high-quality construction and finish: for the first time ever, both Leica cameras and the lenses in this set are made from solid stainless steel. Both cameras stand as symbols for the origins of Leica photography and the present day. The Leica M-A, with technical specifications based on the currently available Leica MP film camera, is a direct descendent of the Ur-Leica. Many of the elements Oskar Barnack invented for the Ur-Leica are revisited in this new camera. These include the fabric focal-plane shutter, the accessory shoe and removable baseplate – and of course it is built for using film. Alternatively, the second camera, a Leica M Monochrom, is the contemporary variation of the theme composed a century ago by Oskar Barnack. As the world’s first camera conceived exclusively for black-and-white 35 mm digital photography, and featuring a sensor specifically designed for this purpose, it carries the traditions of black-and-white photography into the digital age and sets entirely new standards of imaging quality. Alongside the exclusive combination of products, above all the premium finish is one of the outstanding features of the Leica M Edition 100. This is the first time that stainless steel – a material that is extremely difficult to work with – has been employed for the visible metallic elements of Leica products. A special protective coating applied by a Swiss company protects the exposed surfaces against finger marks. Resistant and durable in equal measure, this material guarantees enduring value preservation and lends the products a refined character with a silky sheen. The premium appearance of both camera bodies is further complemented by the application of a special black leather trim. The set also includes three Leica Summilux-M lenses with focal lengths of 28, 35 and 50 mm. Renowned for their combination of extremely compact size, speed and exceptional imaging quality, they ideally reflect the characteristic performance criteria with which Leica lenses contributed to the establishment of the brand as a legend. The M centennial set will be supplied in a black anodized aluminium case constructed by Rimowa especially for Leica. Inside, the case is subdivided into compartments precisely tailored to the individual components of the set and lined with real leather in black. The set also includes Kodak TRI-X 400 black-and-white film for use with the M-A. This film is considered a classic in the genres of art photography and reportage and is still renowned and extremely popular for its unmistakable look in prints. Special engraving on the top plate of the body commemorates the centennial, as do the unique serial numbers that end with the four digits of the years between 1914 and 2014. The Leica M Edition 100 is strictly limited to 101 sets for the entire global market. The cameras and lenses will be available exclusively as sets from Leica Stores and Boutiques from June 2014; none of the items contained in the sets will be available as separate items. The newsmagazine [M]ittelhessen , published in Wetzlar, asked its readers to send in Leica related pictures to be published in commemoration of the grand opening of the new headquarters of Leica Camera AG in Leitz Park in Wetzlar. Wolfgang Sperling, the owner of this M3 was an apprentice at Leitz. In 1957 he built this camera himself from the first to the last assembly step. 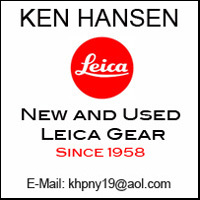 “It was the pride of a Leitzianer (Leica employee) to own his own Leica” one former employee wrote. Many of the readers followed the request and sent pictures which show many interesting and even amazing things. They give an intimate account of the company and its working environment. From 1948 to 1989 high quality custom optical glasses were developed for production at Leitz. Here Rainer Dreuth (right) and Helmut Gaul can be seen casting an experimental fluorophosphate glass. It is both a beginning and a return. With the inauguration of its new and larger corporate headquarters, Leica Camera AG is returning to its roots. Wetzlar, in the German state of Hesse, is the birthplace of the Leica camera and the home of Ernst Leitz, the company that went on to become Leica Camera AG. This is where, 100 years ago, Oskar Barnack invented and constructed the first successful still-picture camera for 35 mm cine film with a negative format of 24 × 36 mm and laid the foundation of the Leica 35 mm camera – an innovation that irrevocably changed the world of photography and paved the way for countless classic, spectacular, historic and earth-shattering photographs. We would very much like you to join us for the official opening of our new complex and the celebration of ‘100 Years of Leica Photography’ and warmly invite you to visit our ‘Open Day’. Find out all about the world of the legendary Leica products, ‘Made in Germany’, first hand – and closer than ever before. Experience the Leica legend and take a look behind the scenes at the precision and quality of Leica manufacturing processes. Join us on a journey through the history of 100 years of Leica photography. The Leica Galerie and numerous cultural highlights are waiting to amaze and inspire you. In addition to the Leica product milestones from our very beginnings to the present day, we will also be showing a multitude of exhibitions of photography through the ages. Masterpieces by world famous Leica photographers from a whole century of Leica photography. Pictures that made history; complemented by works of contemporary photography that will write the next chapters. Food, drinks and a fantastic programme for children are all laid on. And there is no need to register if you wish to come. Even after our Open Day you have the possibility to visit our “World of Leica Camera” in the Leitz-Park Wetzlar. Wetzlar. "Leica ist eine Marke. Leica hat einfach Potenzial." Das hatte der heutige Aufsichtsratschef Andreas Kaufmann 2004 sofort erkannt. Der Salzburger Investor kaufte damals das vor der Insolvenz stehende Kameraunternehmen. Heute schreibt Leica schwarze Zahlen, feiert hundert Jahre Kleinbildfotografie und kehrt mit einem 65-Millionen-Euro-Neubau nach Wetzlar zurück. Eine Erfolgsgeschichte. Es war das Jahr 1914, als Oskar Barnack, Leiter der Versuchsabteilung bei Leitz, die Ur-Leica erfand und damit die Fotografie im vergangenen Jahrhundert revolutionierte. "Barnack, das war ein Tüftler und Erfinder", erinnert sich Günter Osterloh, ehemaliger Produktmanager bei Leica, Verfasser von Anwenderberichten und Leiter der Leica-Akademie bis 2002. Osterloh, der derzeit alte Schätze im Leica-Archiv für die Ausstellung im Wetzlarer Neubau sichtet und aufbereitet, verweist gerne darauf, wie Barnack Anfang des 20. Jahrhunderts einen Schokoladendieb mit einer versteckten Plattenkamera in seinem Büro überführte. "Er versteckte sie hinter einer Wandverkleidung, knotete das Ende einer Schnur an den Auslöser und das andere an die Schublade, in der die Schokolade lag. Der Dieb knipste sich selbst." In dieser Zeit entwickelte Barnack auch die Ur-Leica. "Allerdings", so weiß Osterloh, "mehr nur so nebenbei, als Hobby." Ein Hobby, das um die Welt ging. Zuerst mit Ernst Leitz II, der mit der Kleinbildkamera im Gepäck eine Überfahrt nach New York unternahm. Zehn Jahre später entschied Leitz II, die Ur-Leica in Serie zu produzieren und weltweit zu vertreiben. Das Produkt schlug ein. "Hätte es diese Kamera nicht gegeben - wir würden heute hier nicht sitzen", sagt Stefan Daniel, Bereichsleiter Produktmanagement bei Leica-Camera. Dabei sei es nicht nur die kleine Ur-Leica, die Foto-Geschichte geschrieben hat, so Daniel. Auch das Zubehör, das Barnack erfand, sei wegweisend gewesen. So hatte der Leiter der Versuchsabteilung eine Filmpatrone entwickelt, um den Film bei Tageslicht problemlos in die Kamera hinein- und wieder herauszubekommen. Für diese sogenannte Leica-Kassette konnte man den Film als Meterware kaufen und aufdrehen. Dass genau 36 Bilder auf einen Film passen, ist kein Zufall, verrät Daniel: Es habe an der Spannweite von Oskar Barnacks Armen gelegen: "Es war die Länge, die sich ergab, wenn Barnack Filmanfang und -ende bei ausgebreiteten Armen in beide Hände nahm." Auch der Schuh, der auf der Ur-Leica für den abnehmbaren Sucher angebracht war, ist längst zur Norm für alle Kameratypen bis heute geworden: Der Blitzschuh einer modernen Digitalkamera passt noch immer problemlos auf den Ur-Leica-Sucher. Zum Erfolg der Kleinbildkamera hat nicht zuletzt das Leitz-Milar-Objektiv mit 43 Millimetern Brennweite beigetragen. Nur so konnten wirklich scharfe Bilder entstehen, die problemlos vergrößert werden konnten, erklärt Daniel. Inzwischen sind in dem Unternehmen viele Kameratypen produziert worden, die Fangemeinde von Leica ist groß und weltweit zuhause. Dabei gibt es nicht den Leica-Kunden schlechthin, weiß Vorstandsvorsitzender Alfred Schopf: "Es gab mal das Klischee, es sei der 55-jährige Zahnarzt, der zwei Porsche in der Garage stehen hat." Doch dem sei nicht so, versichert der Vorstand. "Die Bandbreite unserer Kunden reicht vom 18-jährigen Nerd bis hin zum mexikanischen Wrestler. Es gibt nicht den typischen Leica-Kunden." Seit 2010 führt Alfred Schopf das Unternehmen, die Kameraproduktion hat er seitdem von 700 auf 2500 Stück im Monat gesteigert. Den gebürtigen Schwaben fasziniert vor allem die Marke Leica: "Sie ist für mich ein Kleinod in der deutschen Markenlandschaft und eine Legende im Bereich der Fotografie." Außerdem habe ihn an der Aufgabe, den Vorstandsposten vor vier Jahren zu übernehmen, gereizt, "Leica dahin zurückzuführen, wo die Marke meiner Meinung nach hingehört: an die Spitze". Dass Leica inzwischen in einem neuen Zeitalter angekommen ist, zeigen nicht nur die schwarzen Zahlen, die das Unternehmen längst schreibt. In Wetzlar ist in den vergangenen Monaten für 65 Millionen Euro ein imposanter Neubau mit 30 000 Quadratmetern Nutzfläche mit gläserner Produktion, Galerie, Museum, Leica-Store, Fotostudio für Profis, und einem Besucher-Restaurant entstanden. Allein 2000 Quadratmeter im Foyer werden als Ausstellungsfläche genutzt, 650 Mitarbeiter haben in dem Neubau Platz. "Das Gebäude soll zum Ausdruck bringen, dass Leica in einem ganz neuen Stadium angekommen ist", sagt Aufsichtsratschef Kaufmann, der Wetzlar als "hochwertigen industriellen Standort" bezeichnet. Der Neubau trägt dem neuen Stadium des Unternehmens Rechnung. Und auch dem Thema Optik: Die Hauptgebäude bilden ein Fernglas und ein Objektiv ab, Intarsienarbeiten im Fußboden und runde Beete sowie der Springbrunnen im Park spiegeln die Linsen wider, ohne die die Fotografie undenkbar wäre. Ohne die Leica, die lebende Legende, natürlich auch. Am 24. Mai feiert das Kameraunternehmen Leica 100. Geburtstag und lädt ein zum Tag der offenen Tür in seinen Neubau im Wetzlarer Leitz-Park. Diese Zeitung hat den Umzug in den vergangenen Wochen begleitet, mit alten und jungen Leitzianern gesprochen, Interviews mit Vorstand und Aufsichtsrat geführt. Lesen Sie unsere Serie "100 Jahre Leica – Zurück in Wetzlar" und ab dem 23. Mai unsere Beilage "Leica – Legende und Leidenschaft". 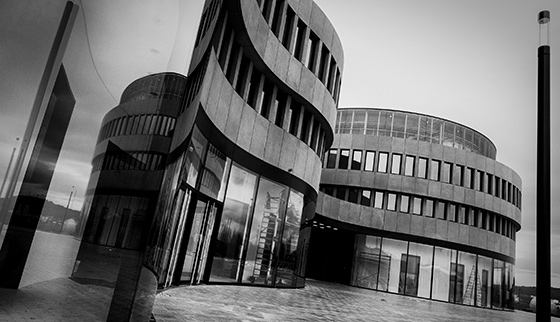 Many Leica owners consider a trip to Wetzlar, the former and new Leica Mecca, a worthwhile undertaking. Less than 50 miles from Frankfurt, it is easy to get to. The guided tours of the new Leica plant at Leitz Park are very informative and offer a close look at how these cameras and lenses are made. Another highlight of visiting Leica is the Leica museum. About 15 miles from Wetzlar is Weilburg. A side trip to Weilburg is definitely worth consideration. It is the location of the topic of this post. I recommend using a route that goes through Braunfels, only a bit more than 2 miles from the former Leica headquarters in Solms. 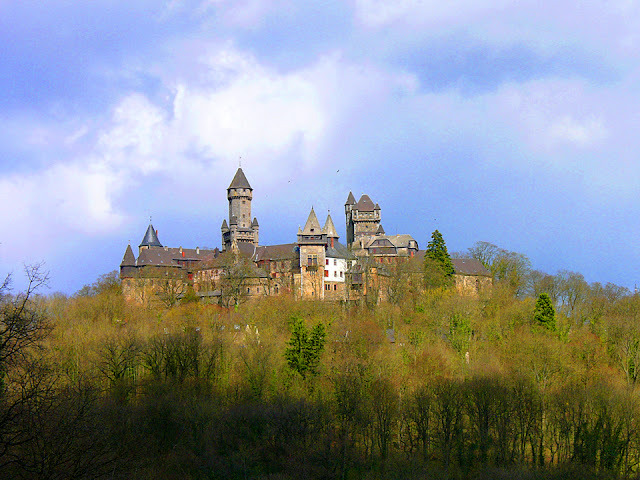 There you’ll have the opportunity to visit Burg Braunfels (Braunfels Castle) which dates back to 1246. 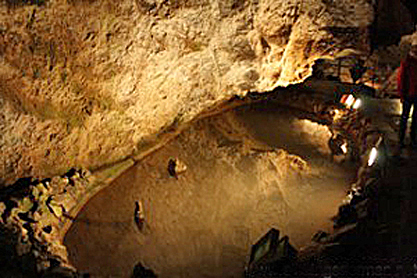 Over the years the story was passed on about the cave, until in 1973 holes were bored in the area that it was believed to be located in. 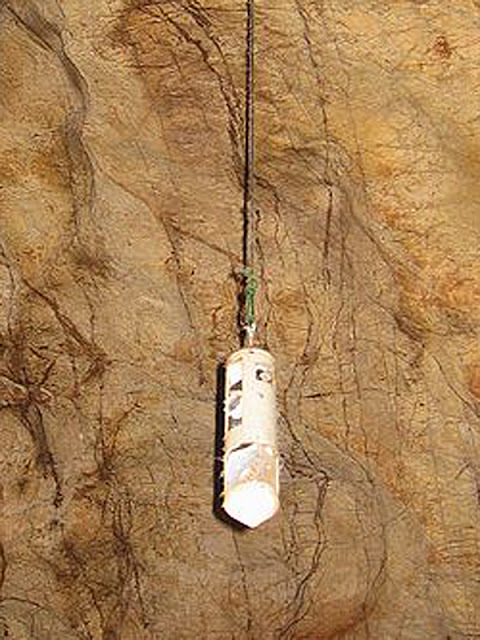 While those boreholes did not find the cave being sought, it did find one with rare crystals on the walls. 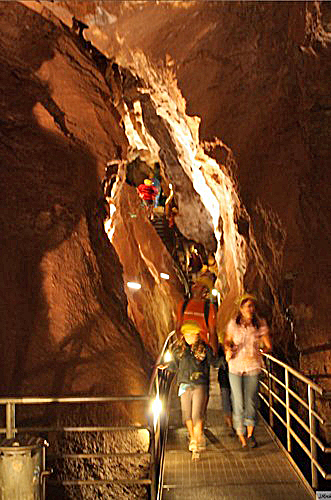 In the years that followed a pathway down to the cave was excavated and since 1981 visitors have been able to take tours. 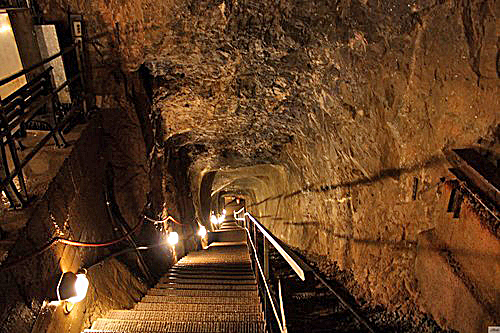 At the deepest point the floor of the cave is 78m (256 feet) below ground, and this part of the cave is 30m (98.5 feet) high – the highest cave that is open to the public in Germany.